Volunteers Needed: Get Your Hands a Little Dirty! Are you interested in gardening? Community building? 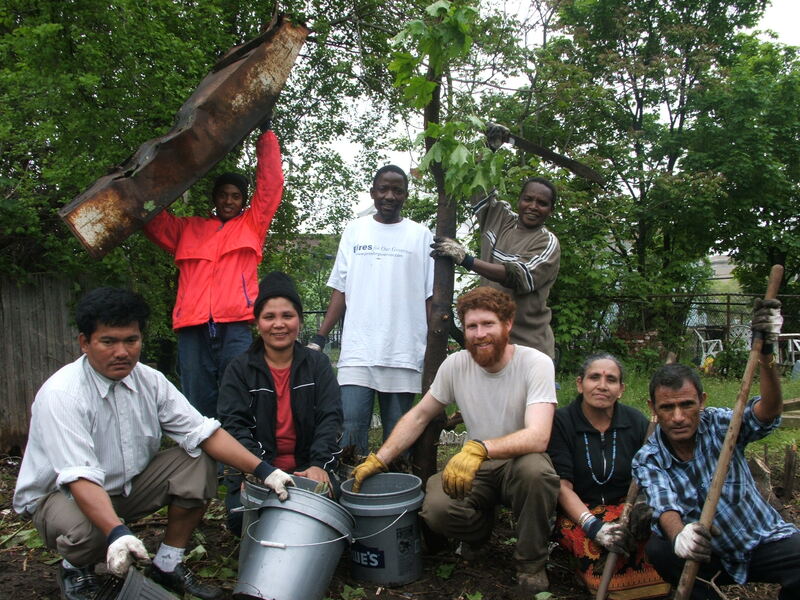 Do you want to meet other like-minded people while making Providence a greener place? Join SCLT in a Community Garden Build Out to expand the Potters Ave. Community Garden. This project will provide the surrounding Providence community access to garden plots/land, where they can grow fresh, healthy food to feed their families. As a volunteer, you are an essential partner in creating community food systems where locally produced, affordable, and healthy food is available to all. Who: Southside Community Land Trust is looking for 30 volunteers to help build a community garden in Providence. All are welcome! We are looking for 4 solid volunteers to help Oct. 11 and then additional 10 volunteers from Oct 12-14 and possibly extending into the following week. SCLT is providing lunch!! What: As a volunteer, you will need to commit a minimum of 4 hours, be able to lift heavy items (such as lumber and soil) and be a team player. Gardening and/or carpentry experience is a plus! When: Tuesday, October 11 through Friday, October 14 from 10:30am to 2:30pm. How: Contact us! Let us know which days and for how long at time. So many great events happened this past September at Southside Community Land Trust! The slideshow below are just some of the moments and memories we had. Enjoy! This past Saturday morning (just two days after our fabulous Harvest Party, phew!) was all sunshine and smiles as over 40 people gathered to learn about the diversity of community gardens in Providence. The group toured 4 community gardens – Davey Lopes, Glenham, Cadillac Drive and Roger Williams Park – to hear from the people who gave their time and energy to building these thriving food-growing hubs, and each garden’s rich history, fertile present and future. Davey Lopes Community Gardens is one of the first models in the nation to be a recreational center with an active community garden. Mr. Taylor, Sterling and George all shared the sentiment of how successful the garden has been with the community, especially with the youth. Kids of all ages have really taken ownership in maintaining and giving life to the garden, as evidenced by the abundance of kid-grown grapes, flowers and tomatoes. The Glenham Garden is a high-intensity garden, where nearly every square foot is used for growing food primarily by Hmong and Liberian refugees. Cadillac Drive Community Garden is long-time project of recently deceased councilman Miguel Luna (on Saturday State Rep. Grace Diaz said a few words and had a moment of silence for Mr. Luna). Though hosted by Southside Community Land Trust (SCLT), the Community Gardens Tour and Potluck was really a success thanks to the Community Growers Network – a group of community garden leaders, urban growers and proactive community members. The tour led up to a harvest potluck at the Roger Williams Park Community Garden – which turned out to be an impressive feast thanks to our talented and gracious friends in the community. People enjoyed dishes featuring garden-fresh ingredients like stewed sweet potato greens with chicken, summery tomato salad, home-made sushi with lots of fresh veggies, salads and so much more! The event was truly a celebration of all the diversity and the beautiful relationships forged within the community. SCLT looks forward to more garden tours in the future, bringing people together from all walks of life in Providence to learn more about community gardens and growing food together! Southside Community Land Trust knows how to party! As you may have heard, Thursday night’s Harvest Party was a spectacular hoorah to our first 30 years of helping people grow food. Together, the 300 people gathered under the tent at the Botanical Center helped raise over $55,000. The Harvest Party was a delicious – and fun – way to plant the seeds for our future. And we have the pictures to prove it! Many thanks to those who attended and our sponsors. Whole Foods, Chex Foods, GTECH, Nortek, Cornish Associates, Edward Angell Palmer & Dodge, United Natural Foods International, Charles Schwab, Malloy Biodiesel, and more! (from our Plant Providence blog) Saturday morning was a beautiful day to learn about over wintering greens and building low tunnels at the Davis Park Community Garden. We learned that plants like chard, parsley, spinach, arugula, carrots and collards are able to survive the winter if kept full grown. These vegetables won’t grow again until March, but you’ll yield a lovely harvest once spring hits! Once you build your low tunnels you won’t need to water the entire season. Try to “aerate” your low tunnels on sunny days to regulate humidity. If you wanted to harvest, don’t be scared if your plants look really bad after they get exposed to the cold air. They will be shocked by the sudden fluctuation in humidity levels but they’ll bounce back in a few days (aren’t plants amazing?). Any questions about over wintering greens and low tunnels can be directed to Katie (katie.miller@gmail.com) of Scratch Farm! Thanks Katie for doing the demo for us! Read more about over-wintering greens on our Urban Ag. Resource Center. Last month’s City Fest was an absolute hit! Close to 200 kids and adults attended the annual block party at City Farm, which celebrates the end of the summer Children’s Garden program. There was music and dancing, potato stamp making, double dutch, watermelon and popcorn eating, face painting and of course, the Big Nazo puppets. Thank you again to everyone who joined us that day, and thank you to our sponsors–Citizens bank for donating new book and backpacks for the kids to start of a new school year! Our video certainly captures the fun we had that afternoon! Southside Community Land Trust is pleased to announce that the following restaurants will be cooking up fresh, locally grown produce for partygoers: Al Forno, CAV, Chez Pascal, Cook and Brown, Edgewood Café, Friendship Café, Genesis Center, Julian’s, La Laiterie, Local 121, New Rivers, Nicks on Broadway, Pho Paradise, El Rancho Grande, and Sunnyside Café. The event will also feature a cupcake landscape of one of our gardens from Sin Cupcakes and Cold Fusion Gelato. SCLT’s Community Gardeners will also be on hand to share the “fruits of their labor” – their own locally grown fruits and vegetables – with party guests. All attendees will take home a goodie bag of garden fresh tomatoes, greens, herbs, and more. 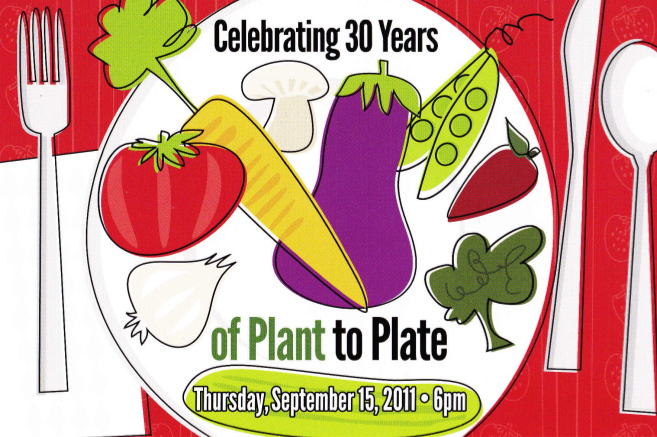 Southside Community Land Trust’s Harvest Party: Celebrating 30 Years of Plant to Plate brings together over 300 people who have helped change the look – and taste – of urban food production in Rhode Island. Tickets are $100 each. Proceeds from the 30th Harvest Party support SCLT’s core program activities, including expansion of the Providence Community Growers Network to help people grow more food in all neighborhoods of Providence. ABOUT SOUTHSIDE COMMUNITY LAND TRUST’s 30th ANNIVERSARY — STILL GROWING AFTER ALL THESE YEARS. families to raise food their own food and improve their own health and nutrition. Harvest Party Update: We want you to join us! Thursday, September 15th – is soon upon us. Don’t miss out on Southside Community Land Trust’s biggest party of this anniversary year. RSVP today and celebrate 30 years of growing food and building community with an evening of Rhode Island food and drink, featuring foods from our own Land Trust farmers prepared by fourteen fabulous local restaurants. 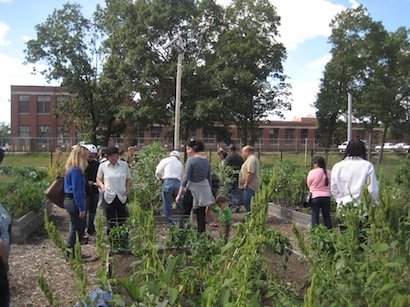 Interested in learning more about Providence’s community garden scene? Southside Community Land Trust (SCLT) invites you to attend a free and open Community Gardens Tour and Potluck on September 17 from 10am-1:30pm. The tour will meet and finish at Roger Williams Park Community Garden (located next to the Botanical Center) and will go to 3 other gardens: Davey Lopes, Glenham and. Cadillac Drive. For those who want to go by bike, meet at Davey Lopes at 10:30am! It’ll be a great chance to get acquainted with the diversity of gardens available in Providence, as each has its own vibe and unique character. The tour will be led by SCLT’s Cindy Llamas (Community Growers Coordinator) and Liza Sutton (Community Growers Network Director) as a part of an effort to expand the Community Growers Network (CGN), a voluntary, community garden-led coalition. Launched by Southside Community Land Trust and community partners in 2009, the Network includes over 35 community gardens in Providence and Pawtucket and is an exciting opportunity for gardens to work together to share resources, information, and experience. 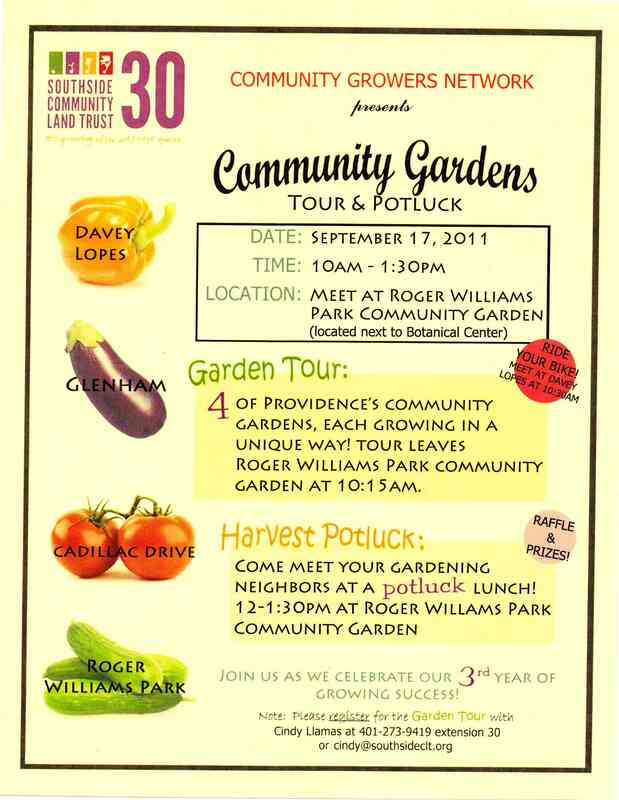 At the end of the tour, there will be a Harvest Potluck from 12-1:30pm at Roger Williams Park Community Garden. This is also free and open to anyone who wants to enjoy a delicious garden-fresh meal and meet other community gardeners. Just register for the Garden Tour with Cindy Llamas at 401-273-9418 ext.30 or cindy@southsideclt.org.